Fall Colors are Coming to the Texas Hill Country! 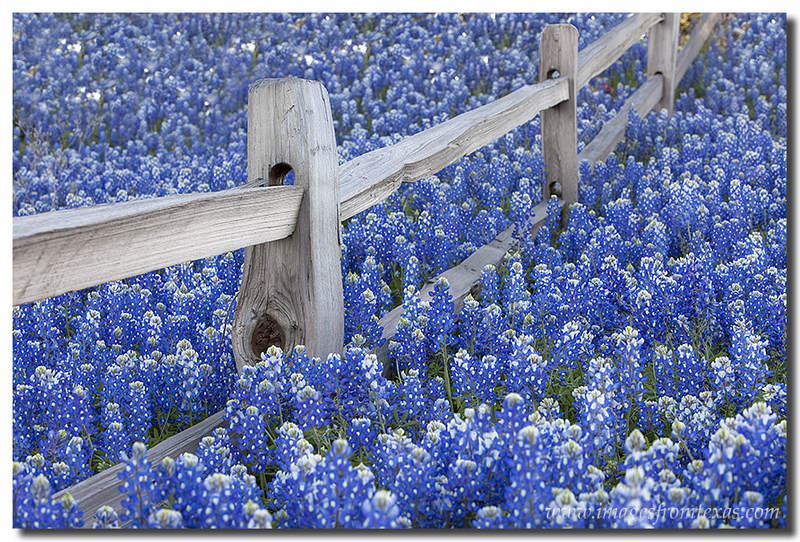 Autumn Colors in the Texas Hill Country are on the way! Each year in mid November, the leaves of the maple, oak, and cypress begin turning from green to red, orange, and gold. If you drive through the rolling hills of this area, you are sure to find colors and scenes that are photo-worthy between every town. Tomorrow is November 1st, and tonight is forecast to be our our coldest evening of the fall so far with lows in the 40s. First, the Devil’s backbone – the drive from Wimberley to Blanco along 2325 – gives you some nice views of hillsides that often have a patchwork of orange and red. Stop in Wimberley for pizza at Brewster’s Brewery for lunch and check out the art galleries, as well. Second, another popular location is Lost Maples State Park near Vanderpool, Texas. This area can become quite crowded on a nice November day. Go during the week if you have the flexibility. If you have to go on the weekend, arrive very early – like for sunrise. If you get there after 9am, you can often find a mile long and hour wait to enter the park. Also, the roads around the park like 337 and 187 have cross some nice creeks. These little streams are often lined with glorious cypress trees that offer oranges and reds that are perfect for capturing holiday images. Third… If you enjoy quaint towns, check out Gruene, Texas, home to the famous Gruene Hall. The Guadalupe River runs through town and offers wonderful places to check out antique stores or take a stroll along the river bank and enjoy the cypress trees. For lunch or dinner, check out the Grist Mill in New Braunfels. It’s famous for a reason! Fourth, and a bit closer to my home, one of my favorite locations to capture the colors of the season is Pedernales Falls State Park just about 8 miles from Johnson City. 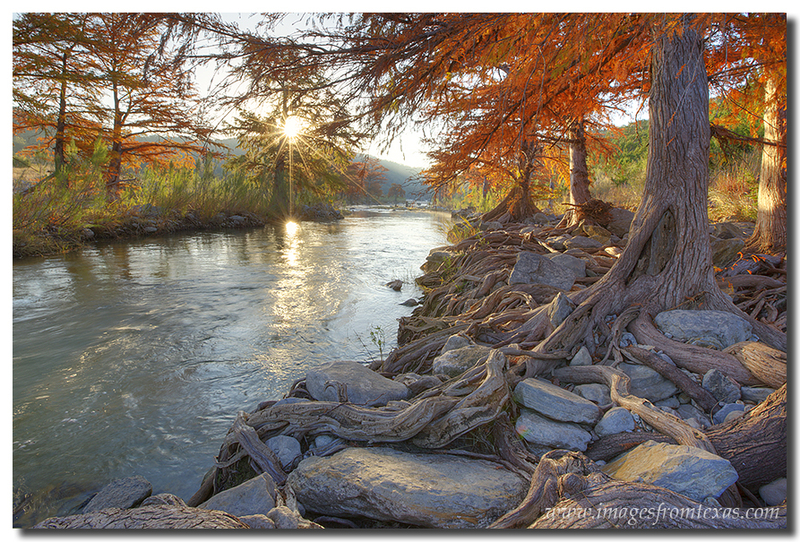 I know just about every curve and bend of the Pedernales River in the river in this area, and that second and third week in November can offer up some great color at sunrise as the sun breaks over the horizon and streams through the cascading cypress trees. If you like to scramble over rocks and get away from crowds, this little Texas state park is just the place for you. You’ll find me out here on several occasions later this month. 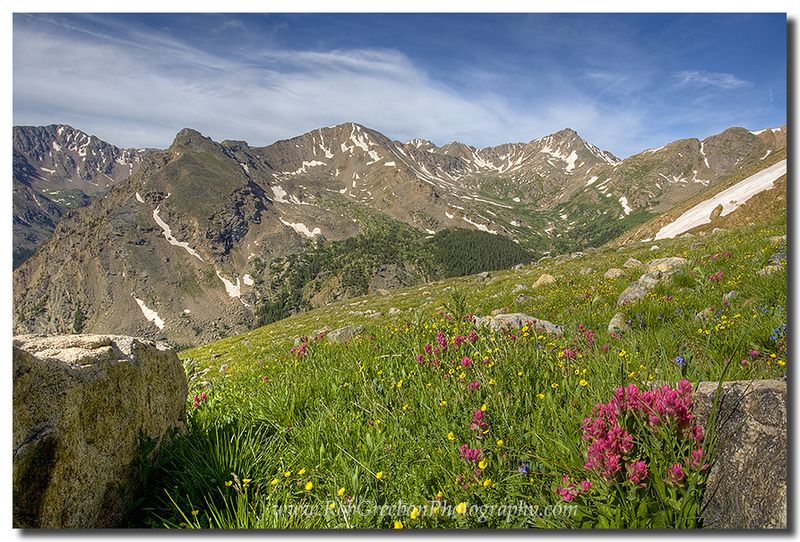 Besides wildflower season in the spring, this is my favorite time of year! 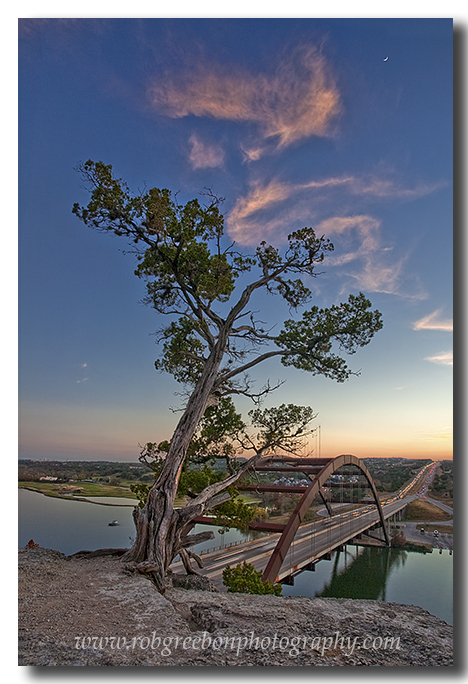 Below is a photograph of one of my favorite stretches along the Pedernales. 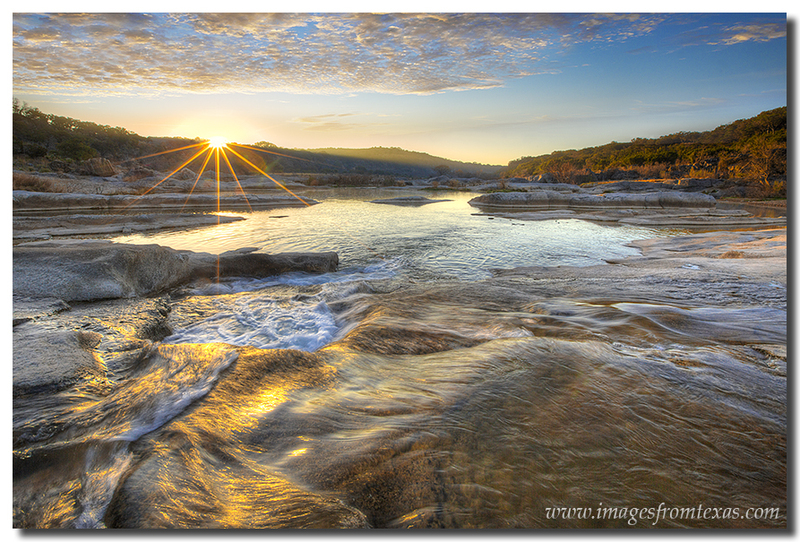 Autumn colors shine in the morning light at Pedernales Falls State Park in mid-November. I know there are so many other great places to visit. These areas I mentioned are just a sprinkling of what is out there. 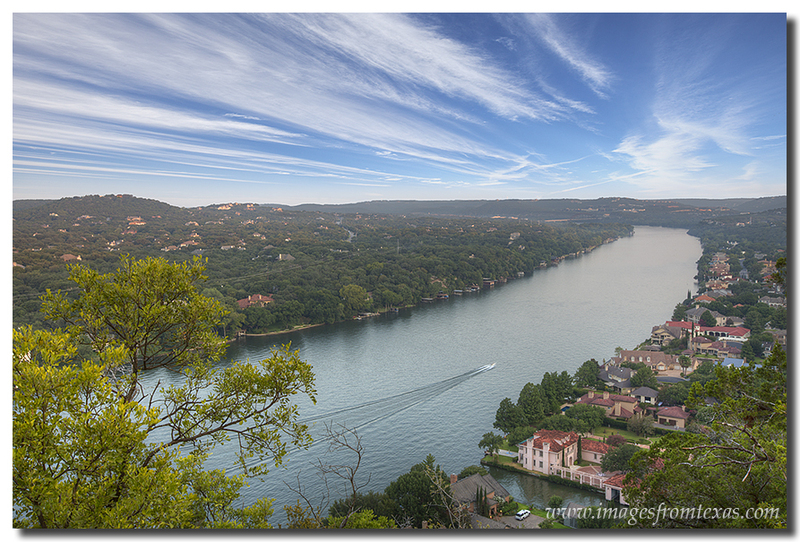 If you’d like to see more images of these beautiful rolling hills, please see my Hill Country of Texas gallery. 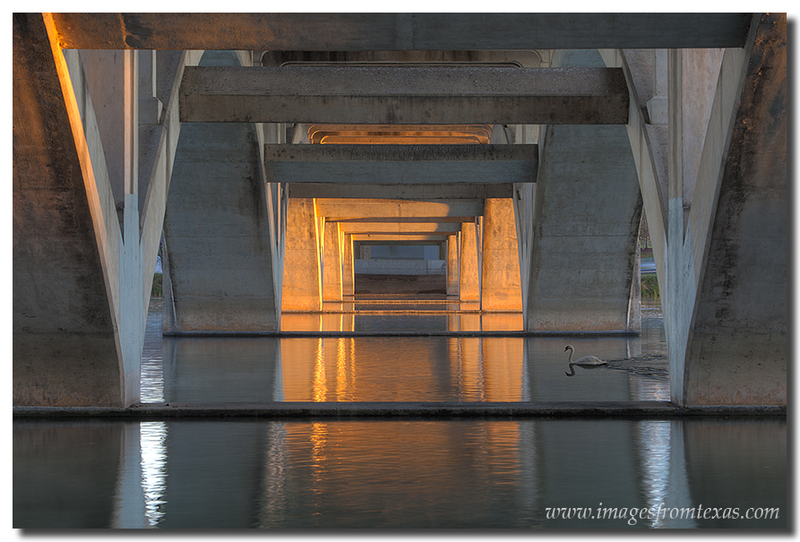 I’ve been asked several time what my favorite places are around Austin, Texas, to photograph. After thinking a bit, I thought I’d come up with my Top 10 list. In the meantime, you can follow my current photographic adventures on my Facebook Photography business page. 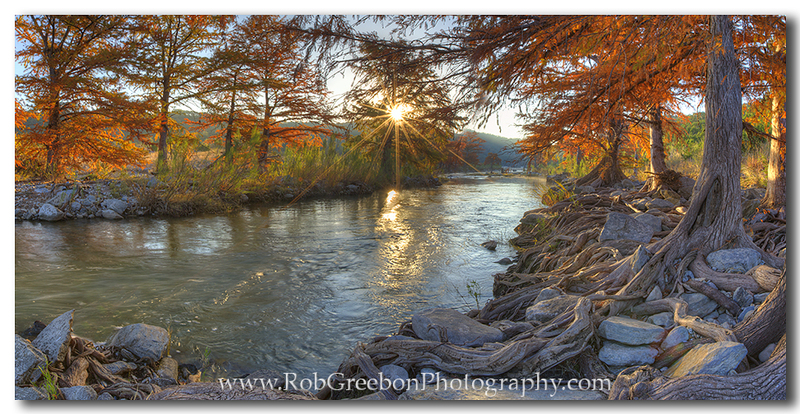 You can also find my images at one of my business sites – either Rob Greebon Photography or Images from Texas. So, here are my Top Ten locations around the Austin area (and a few that are short drives out of town). Located just off 2222, Mount Bonnell is the 2nd highest point in Austin and offers great views of the Colorado River and the 360 Bridge in one direction and the Austin skyline in the other. It is a short walk up some steps from the parking lot. From here, you can enjoy great sunrises and sunsets. If you shoot in the morning, the sun will be at your back. Shooting towards the river and the 360 Bridge in the evening will have the sun setting in front of you. The view from Mount Bonnell in Austin, Texas is great for photographing the 360 Bridge to the west and looking at the Austin skyline to the east. Home to world class performances, the Long Center also offers a balcony with a fabulous view of downtown Austin. At sunrise you’ll have the sky turning colors. In the evening (on a night when there is no show) you can have the Austin skyline lighting up as sunset fades. 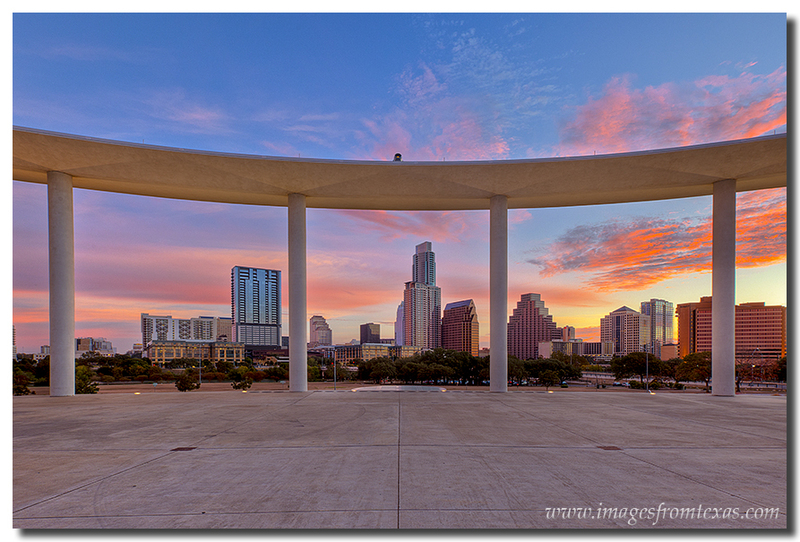 The Austin Skyline seen from the Long Center before sunrise. 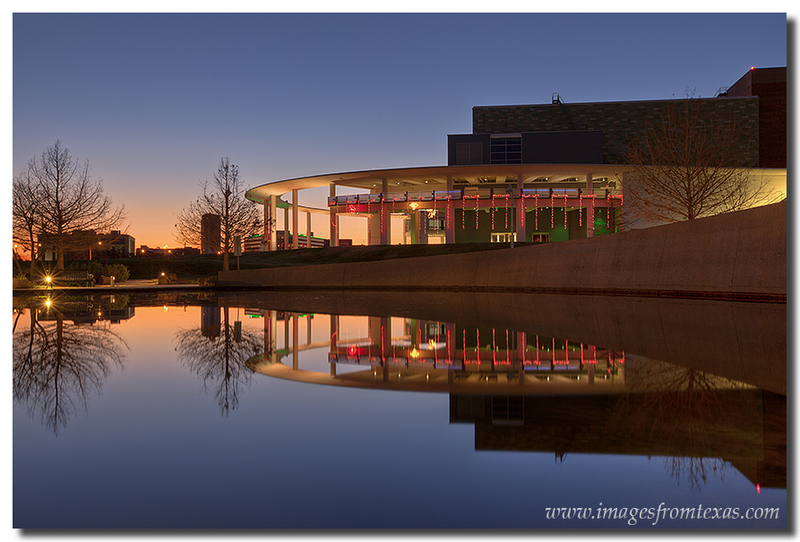 The Long Center in downtown Austin sits quietly in the early morning. Take your camera and walk the trails at Zilker Park that surround Lady Bird Lake. You’ll find numerous locations to shoot from, including the foot bridges that cross over Barton Creek as it feeds into Lady Bird Lake. Swans and water fowl also provide opportunities to photograph these beautiful creatures as they enjoy lazy afternoons in the clear water. 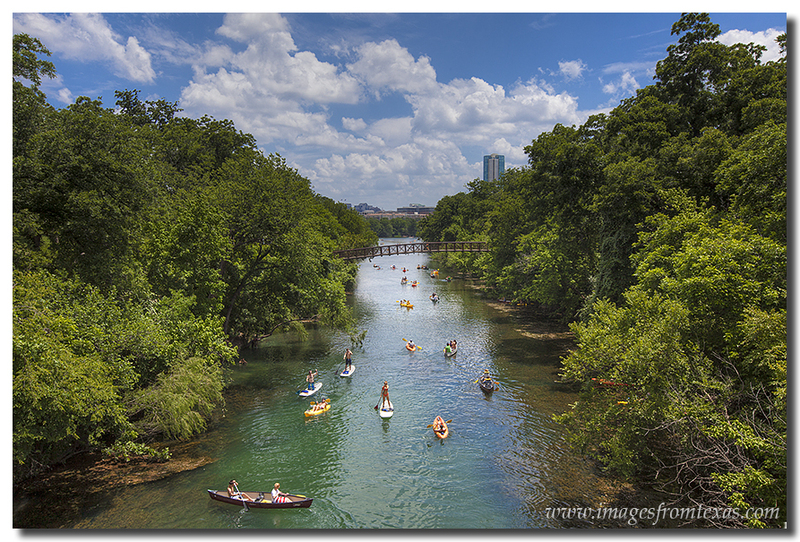 Folks enjoy water sports on a summer afternoon in Zilker Park in the shadow of downtown Austin, Texas. Lou Neff Point is along the Zilker Park Hike and Bike Trails, but it deserves it’s own mention. This point offers a great view of the Austin skyline across the waters of Lady Bird Lake. I love mornings here when the sun rises in front of you and lights up the sky. In the early morning calm, you can often capture a great reflection of the skyline in the water. 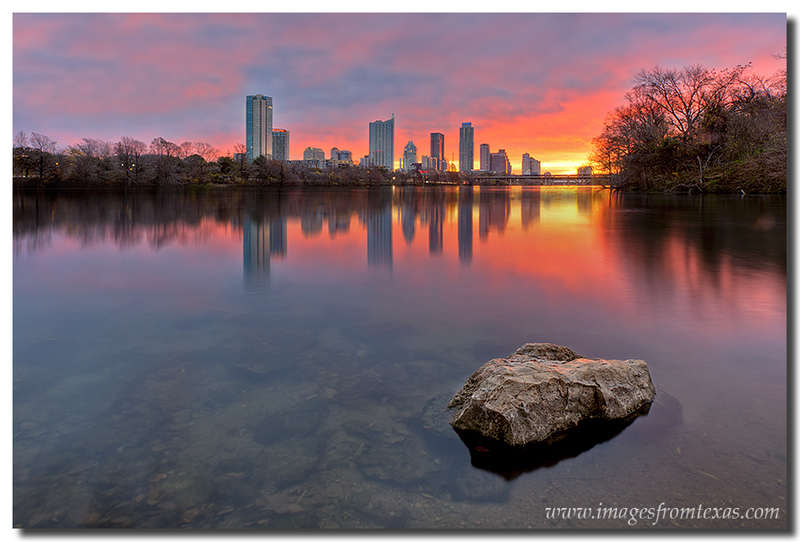 Daybreak appears over the Austin skyline and Ladybird Lake on a cool December morning as seen from Lou Neff Point. The Zilker Park Clubhouse is on the opposite side of MoPac. It is often locked up with a gate, but there are trails leading to the balcony that afford you fantastic views of downtown Austin. Just down the road (before you reach the clubhouse) is a small parking area that leads to another great view of the Austin skyline. If you shoot here at sunrise, you’ll have the sun rising in front of you. In the evenings, you’ll have a backlit skyline with glass reflecting the oranges and reds of the setting sun. 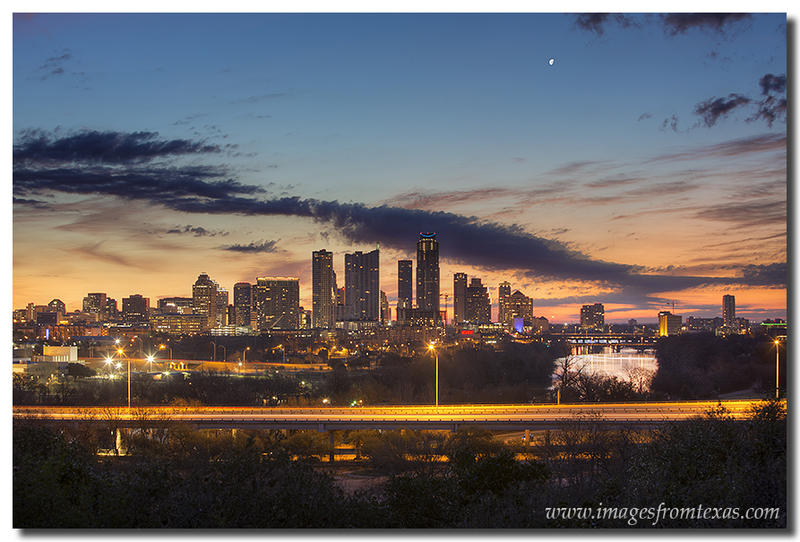 The Austin skyline comes to life as the first light of day appears. Also located along the Zilker Park Hike and Bike Trails, these two bridges offer opportunities to capture unique views of Austin, including kayakers and scullers, views of the state capitol (from Congress), and the interesting architecture of the bridges themselves. Lamar and Congress Bridges offer interesting architecture and unique photo opportunities. 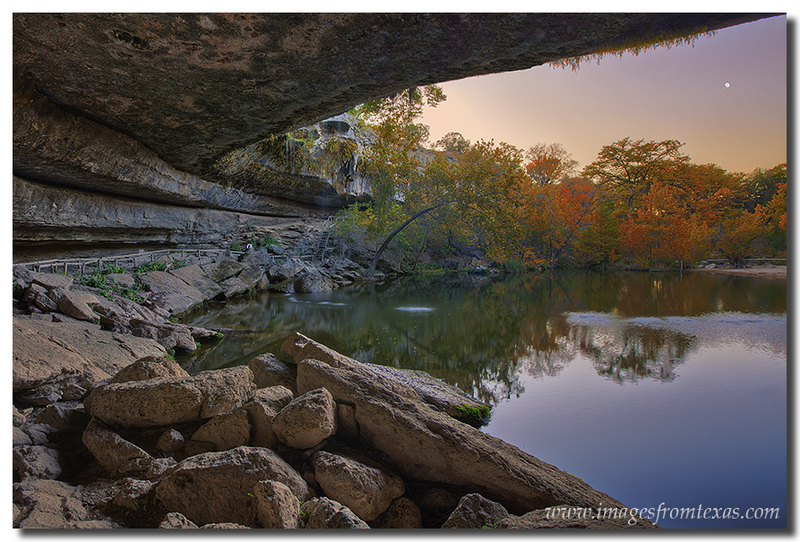 Hamilton Pool is a great place to spend an afternoon and enjoy the views. Famous for the UT Tower, the University of Texas also offers interesting architecture and pools to photograph. Still, the tower is an icon and one of the most photographed locations in Texas. 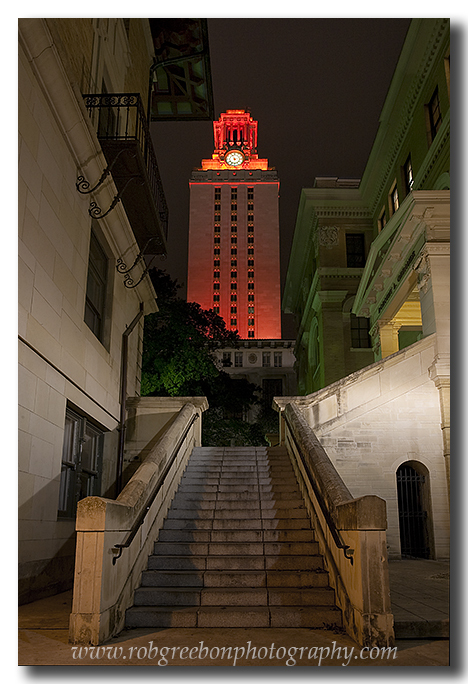 Pick an evening when UT has the tower lit orange and your image will be further enhanced. The University of Texas Tower is lit orange after the football team defeats Texas A&M. Pedernales Falls State Park is located about 45 minutes outside of Austin and is well worth the drive through rolling hills. In the spring, wildflowers bloom along the clear waters of the Pedernales River. In autumn, the cypress trees turn a brilliant orange. In summer, cool off in the cold water and enjoy an afternoon. Sunrises and sunsets offer great chances to catch the soft light. The way the river twists and turns, you can always find an angle that gives you a colorful magic hour. Fall colors at Pedernales Falls State Park offer amazing photo opportunities. Outside of Austin at the intersection of 2222 and the 360/Capitol of Texas Highway, Percy Pennybacker designed a steel bridge that would span the rivers of the Colorado River and never touch the waters. The result, Pennybacker Bridge, is an Austin icon. On the northwest and northeast cliffs, you have wonderful views of the bridge and the hill country (from the north east cliff) or the bridge and the Austin skyline (from the northwest cliff). Recently after a few accidents by people falling off the cliffs, signs were posted in the parking lot that indicate you can’t park there. Locals seem to ignore these signs. If you are rules follower, you can still park in the nearby neighborhood around the bridge and walk. Pennybacker Bridge is a great place to enjoy a sunrise or sunset – and it doesn’t matter if you bring a camera! 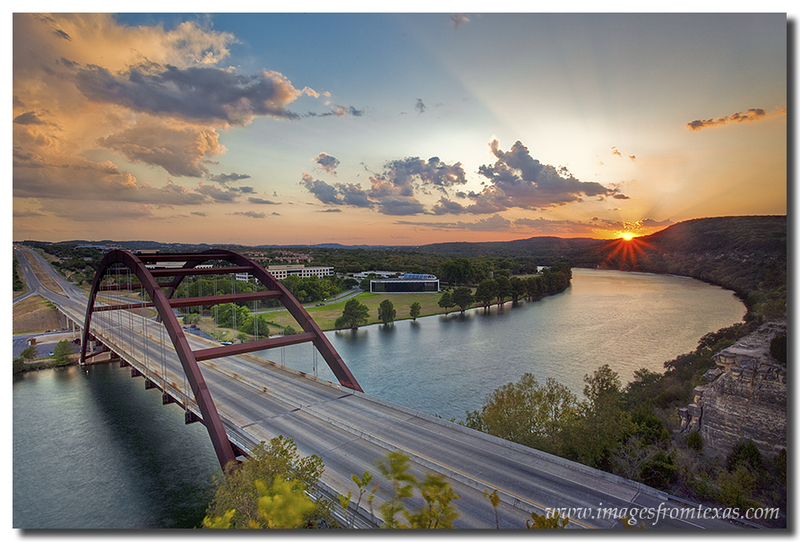 Sunset comes to Austin, Texas, and the 360 Bridge on an August evening. 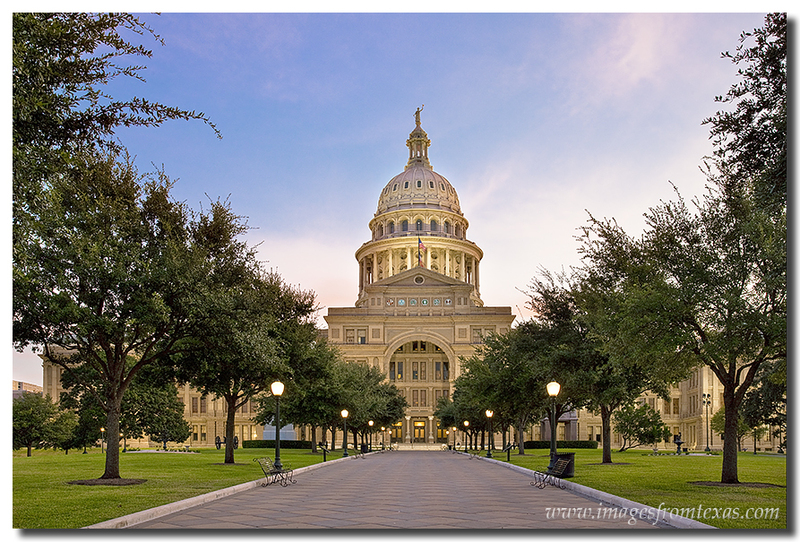 The Texas State Capitol sits on 22 acres of lush grass, walkways, and monuments. The front and back of the capitol offer great views, especially in the early morning when you rarely find anyone around. With a soft light, you can use a wide angle to capture the grand scene of the nations’ 2nd largest capitol (second only to the capitol in Washington DC), or you can use a zoom to photograph the top of the limestone structure with the Texas and US flags. Nearly any sidewalk offers a great view. You can even walk down Congress in either direction and capture the scene with streetlights leading to the capitol grounds. The Texas State Capitol is calm in the early morning hours just before sunrise. There are so many more opportunities around Austin than I can mention here. SoCo (South Congress), the Graffiti Castle, South Lamar, the bats in the late summer, and many other options are there. These locations are some of my favorite views of Austin, and I hope to keep finding more and more places to visit. I’d love to hear your favorites. Drop me a line or make a suggestion. Thanks for Reading!